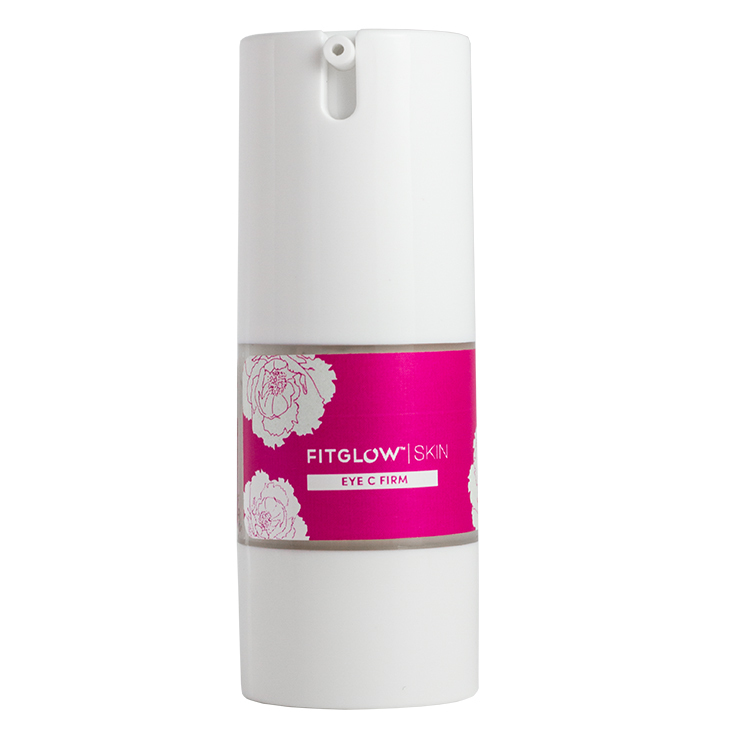 Reverse the look of tired, puffy eyes with Fitglow Eye C Firm. Designed to diminish the appearance of dark circles, lines, and puffiness, this moisturizing cream contains vitamin C, probiotics, and peptides to improve the look of skin tone and firmness. 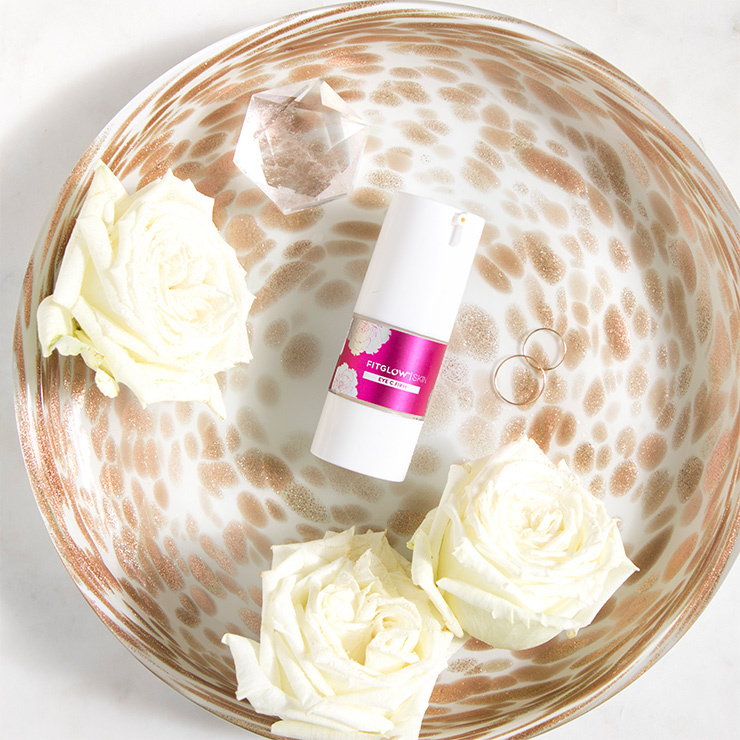 Vitamin K and caffeine have been added to reduce the look of redness and decrease signs of puffiness, while making the delicate skin around the eye look brighter and revitalized. Skin is left with a healthy, youthful appearance. Apply one pump of eye cream to ring finger and gently pat onto skin around the eyes. May be kept in the refrigerator for a cooling sensation that boosts a look of decreased puffiness and firmer skin. May be used on its own or under makeup. Aqua, Cetearyl Olivate (Olive Source), Sorbitan Olivate (Olive Source), Argania Spinosa (Argan) Oil*, Simmondsia Chinensis ( Jojoba) Seed Oil*, Butyrospermum Parkii (Shea Butter)*, *Rosa Canina (Rosehip) Oil, Vitis Vinifera (Grape) Seed Oil, Leuconostoc/Aloe Barbadensis Leaf/Sorbus Aucuparia Fruit Ferment Filtrate, Phospholipids & Ascorbyl Palmitate (Vitamin C Liposome), Helianthus Annuus (Sunflower) Seed Oil & Succinite Extract (Amber Extract), Lactobacillus Ferment Lysate & Camellia Sinensis Leaf Extract & Punica Granatum Extract & Caffeine (Eye Firm Complex), Phospholipids & Phytonadione (Vitamin K Liposome), Cucumis Sativus (Cucumber) Fruit Extract, Cetyl Alcohol, Sodium Hyaluronate (Hyaluronic Acid).